For the record, I am not a Gordianus fan. I very much enjoyed Saylor’s multi-generational epics Roma and Empire, which I reviewed, but didn’t take to the couple of Finder novels I sampled. Not because they were bad books, but because I’m not that into historical mysteries. Every reader has her quirks. This book has a distinctly different structure from the others. Saylor uses the journey to visit the Seven Wonders as a framework for several short stories (many of which were previously published in mystery and fantasy magazines.) Each Wonder gets a story with a few interludes, such as attending the Olympic Games and visiting the ruins of Corinth, resulting in ten chapters dealing with murder, witchcraft, ghosts and gods. As their journey continues, a larger mystery entangles Gordianus and Antipater with spies and other enemies of Rome. One of the things I admire most about this book is the incredible research and description of the Wonders and the cities Gordianus and Antipater visit. 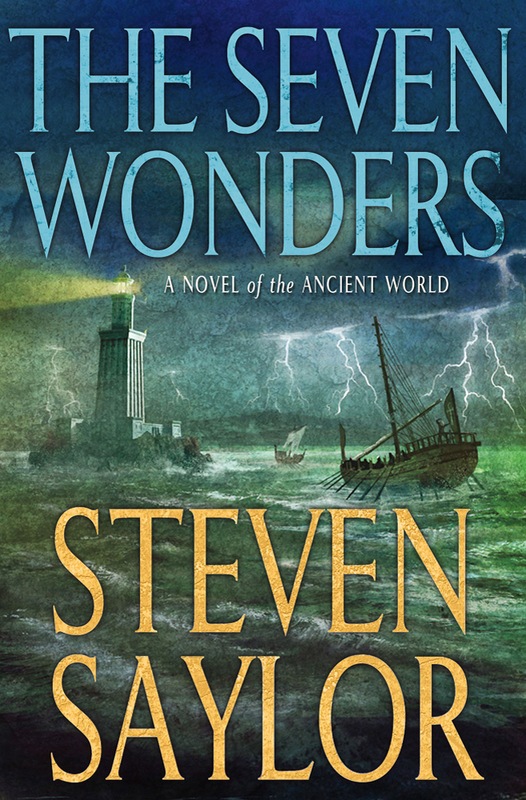 As Saylor says in his Author’s Note: “To explore the Seven Wonders, one enters a labyrinth of history, legend, hard facts and half-facts, cutting-edge archaeology and the very latest innovation in virtual reality.” He does a great job of bringing the locations alive and seamlessly incorporating history into the narrative without bringing the stories to a screeching halt. Each Wonder is given its due with historical accuracy and vivid description. For this alone, I’d recommend the book. For Gordianus fans, it’s a must read. Note: The publisher provided a free copy of this book, but the opinions expressed in the review are my own and not in consideration for the book. Thanks to Minataur Books for providing two copies for the giveaway. Entry is easy: leave a comment on this post by midnight EST Saturday, July 21 (email not necessary in the post). If you want a second entry, sign up to follow the blog or indicate you’re already a follower. For a third chance, repost this giveaway on your Facebook, blog, Twitter, website, etc. and post the link in your comment. Don’t worry if your post doesn’t appear immediately, because I moderate comments and don’t spend my life at my computer. I’ll randomly select the two winners and announce it on Sunday, July 22. Good luck! I’ll be in touch shortly re addresses for shipping. The Seven Wonders sounds like my kind of read. I actually love most historical mysteries and I enjoy good character growth and development. Thanks for the interesting review, as always. I am a follower. I have loved the Marcus Didius Falco series, often laughing out loud at the situations Falco, Helena, Petro and Maya get into. I would love to receive one of the giveaway copies, but I must say I am already a fan of Lindsey Davis. If the attention to detail and characters is as thorough in the Seven Wonders as in the Falco series, it will be a great book. Hi Betty. I’ve enjoyed the Falco series as well and reviewed/gave away Alexandria last year. The Gordianus series seems (from the three books I’ve read) a darker series, but just as well researched. Good luck in the giveaway! Loved [Alexandria]. I managed to catch it on the new books shelf at our local library when they first got it (Tuesdays are the best days for that). Last year I was sick for several weeks in the summer and had thus read all the Gordianus novels. Since then I’ve been looking forward to “The Seven Wonders”. So glad it’s finally available! I feel the exact same way about Saylor’s books, loved Roma and Empire, but didn’t care for the several Finder stories that I picked up. However, The Seven Wonders was, for me, one of those rare books that you read more slowly as you get closer to the last chapter, because you can’t stand for it to end. Aside from all the didn’t-see-them-coming twists and turns, reading about the ancient 7 Wonders was fascinating! I’d love to read this. I will also sign up to follow your blog. I saw the posting abt the giveaway on GR group. Sorry, made a typo in my email address the first time. 🙂 Thought I was editing the original post, but ended up duplicating it.